The medicinal, mind-altering, material, and nutritional qualities of Cannabis have resulted in human relationships with this plant dating back thousands of years. Its complex and unique chemistry has fostered the development of important discoveries in neuroscience. And the current evolution of its social and legal status has created challenges and opportunities for innovative thinking in the realm of public policy. David E. Presti is a teaching professor of neurobiology, psychology, and cognitive science at the University of California, Berkeley, where he has been on the faculty in molecular and cell biology for nearly 30 years. For more than a decade he worked in the clinical treatment of addiction and of post-traumatic-stress disorder at the Department of Veterans Affairs Medical Center in San Francisco. And for the past 15 years, he has been teaching neuroscience and conversing about science with Tibetan Buddhist monastics in India, Bhutan, and Nepal. 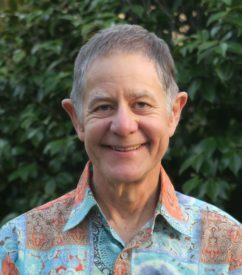 He has doctorates in molecular biology and biophysics from Caltech, and in clinical psychology from the University of Oregon, and is author of Foundational Concepts in Neuroscience: A Brain-Mind Odyssey (2016) and of Mind Beyond Brain: Buddhism, Science, and the Paranormal (2018).